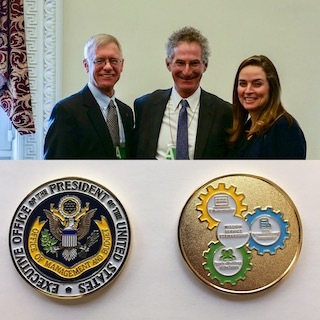 A week ago today, OMB Deputy Director for Management (DDM) Margaret Weichert hosted a celebration marking the first year of this Administration’s President’s Management Agenda (PMA). At this event, a variety of government leaders and external stakeholders gathered to underscore the importance of management as a strategic imperative. The current PMA is premised on a foundational “double trio” of drivers that link IT Modernization, Data Strategy, and Workforce Improvement to better results for the nation, in terms of Mission Performance, Service Delivery, and Fiscal Stewardship. A set of panel discussions led off by DDM Weichert, Federal CIO Suzette Kent, and GSA Administrator Emily Murphy at the National Academy of Public Administration (NAPA). The release of a bookby NAPA with reflections on the PMA, edited by NAPA Fellow Alan Balutis with chapters written by 13 fellows (including a chapter on IT modernization that I was honored to contribute), and a Foreword from the DDM. The launch of the Government to University (G2U) initiative led by the Volcker Alliance, which will bring together people, skills, and research from a network of universities around the country connected to local, state and national governments in a manner very consistent with the PMA priority for a Government Effectiveness Advanced Research (GEAR) Center; the first two G2U sites are in Austin and, appropriate to the establishment of the PMA last year, Kansas City (here are more details from my colleague John Kamensky). And kicking off the week was the release of the Analytical Perspectives document from OMB as part of the President’s Budget, which includes significant detail on the PMA and other management efforts especially in Chapter 6 on evidence and effectiveness, Chapter 7 on workforce, and Chapter 19 on technology. The coalescence of these and related management priorities expand efforts of government working with industry, non-profit, and academic counterparts to ideate, pilot, implement, and share effective practices – which agencies leverage every day to deliver thousands of services and provide countless information resources that help and inform the nation. Given the successful leadership, governance, an implementation during the current PMA’s first year, the second year will certainly bring see continued management progress. The 1990s. The National Partnership for Reinventing Government brought together teams of change agents under the auspices of the Vice President, who worked with OMB to develop and pilot numerous management reforms to modernize government. One of those initiatives was the development of the first web portal for the US Government, FirstGov, which continues today as USA.Gov. Modernizing Acquisition through Competitive Sourcing. The first three of these priority areas laid a foundation for current PMA priorities around IT Modernization, Workforce Improvement, and overall performance; the last two have evolved to inform other PMA initiatives that focus on reducing improper payments and implementing category management to help agencies procure more effectively. The 2010s. The next PMA, built over several years beginning in 2009, centered on efforts to make the setting of priority goals more systematic and part of overall agency budget, strategic planning, and performance management activities. The development of “Cross-Agency Priority” (CAP) Goals through as a high-level, government wide process to focus on key challenges was introduced, bolstered by a revised management statute (the GPRA Modernization Act of 2010). Also established were many more "agency priority goals" (APGs) that focused on mission areas for individual departments and agencies, such as the Department of Veterans' Affairs goal to increase trust among veterans by improving their experience in working with that agency. Among the CAP Goals of this period were “Delivering Smarter IT”, “Buying As One Through Category Management”. “Expanding Shared Services to Increase Quality”, and “Bridging the Barriers from Lab to Market” – each of which (and several others) have continued into the current PMA (for more information, see the 2017 IBM Center report on Cross-Agency Priority Goals). The current PMA – celebrated over past week and implemented over the past year -- builds on and enhances efforts that occurred over two decades, and importantly adds data as a core goal for government management. This work is often unnoticed by citizens who have little daily contact with government -- though who daily depend on government management, whether driving on interstate highways in cars that meet government-issued safety standards, traveling to national parks that are well maintained by skilled government park staff, or receiving social services delivered by caring professionals who work in health, education, and similar agencies. In the current PMA, OMB is leading efforts to raise awareness of the importance of management stewardship to improve government mission performance in serving the nation. This import results from an era of activities that continue to set the stage to build a government for the future that works effectively on behalf of the American people.